Google has finally launched a mobile version of Google Talk, but it's optimized for iPhone's browser. You can access if you go to google.com/talk on an iPhone/iPod Touch or using this permalink: http://talkgadget.google.com/talkgadget/m (shorter URL: http://tinyurl.com/4vnfcd). This Ajax version is based on Google Talk's Flash gadget, but it doesn't include tabs, group chat, options to add contacts and send email. What you can do is to update your status, search your contacts and chat with people that are online. Besides this mobile interface, Google also has a mobile app for Blackberry. That means if you don't have a Blackberry, an iPhone or at least a WebKit mobile browser, you have to find a third-party service. eBuddy is a service that offers both a basic mobile interface for Google Talk and a mobile application that lets you chat faster with your friends. eBuddy doesn't connect only to Google Talk, it's a multi-network IM client that works with MSN, Yahoo and AIM. Unfortunately, I couldn't find any information regarding the way eBuddy stores or uses your credentials and seeing that eBuddy sends the password in plain text is worrisome. Another mobile application that lets you chat with your Google Talk contacts is Fring, but it only works on Symbian and Windows Mobile devices. As usually, make sure you trust the service before entering the username and password of a Google account. I could swear I have seen Fring running on a friend's iPhone. Fring also has the added benefit of being compatible with several flavours VOIP, including Skype and SIP. If you got any Java-Enabled mobilephone, you could use Bombus too. I am a happy Talkonaut user (WinMo, Symbian and Java-based). And of course, there's Eqo now with a Traveller feature that saves you on mobile roaming charges. I've found http://www.nimbuzz.com/ to be the best multi-protocol mobile IM program. A jailbroken device will run AgileMessenger through Installer.app. This application supports the most common IM services, including Google Talk. Better functionality than Meebo, and working much smoother. I really don't get fring. Maybe it's becuase of the phone I have? Q 9c with sprint service and windows mobile 6. I am just not sure that I like the controls or figured out how best to use it. "Fring, but it only works on Symbian and Windows Mobile devices"
Does anyone think it'd be cool to be able to set your status to your current location (a link to your location in google maps)? I use Nimbuzz and it works like a charm on my iPhone 3G. Best of all it is a FREE download from you iTunes online store. You can even make phone call/SMS from GTalk/Gmail to phones. Nimbuzz is a great free application that accepts everything: googleTalk, Skype, Facebook, SIP calling! Am using Nimbuzz for a pretty long time.. and seems to be the best free IM clinet! When is there going to be a native app with video and IMing?? Enjoy real-time chat from almost anywhere on your iPhone/iPod-Touch. Chat with friends and family using Google Chat - Take your instant messaging with you. 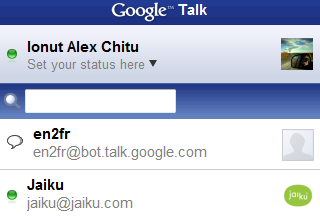 I have added google talk for iphone- but how do i get a sound notification for incoming chat?? I do see a orange notification- but if I'm away from phone or if the TALK app is closed- I want to hear the notification- like an SMS sound...How do it get that? I have iphone 3G. I would really appreciate help! !